This week's tutorial is brought to us by Samantha. 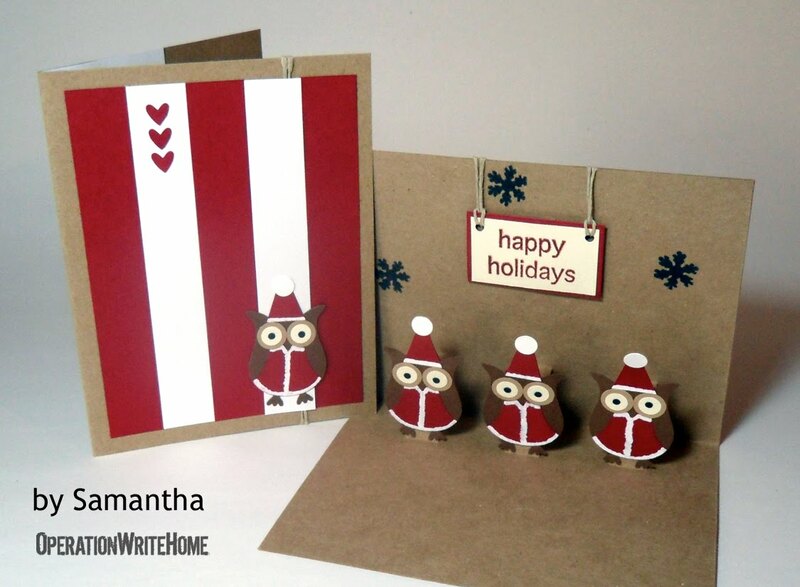 She sent this cute cute Christmas card and we loved it so much she agreed to teach us how to make it. Be sure and visit her site at http://www.expressionsofacraftaholic.blogspot.com/. Reminder - Christmas cards should arrive to the shippers by Oct 30. To make a popup card like this one, you'll need to start out with a 5.5" by 4.25" card base and a 5.25" by 8.25" cardstock for a liner. Score centers and fold. Next you will need to turn over your creased liner. Using a pencil, draw a line 1" up from crease. This is where you will fold your popups. Then measure 1/2" out each way from center and draw a line up to your fold line. Measure another 1/2" out and draw another line up to fold line. These lines will be cut. Cut and fold up the sections to create a crease on fold line. Design inside and outside layouts before adhering to hide any ribbon ends or brads, etc. Use adhesive on all edges to help your popup stand straight without lifting from base. Line up centers and adhere to base! Special thanks to Samantha for this excellent tutorial! Remember, if you would like to submit a tutorial, please write kate@operationwritehome.org. We would love to learn how to do your favorite thing. Meanwhile, give the pop-up a try and link your cards below. Cool, adorable and well done. Love the eyelids on the female owl. Really cute cards. Thanks for the great tutorial. What a fabulous tutorial, your cards are great! I especially love the second one that you used one of the last owh sketches for, cute, cute, cute! Adorable cards! What a surprise inside! 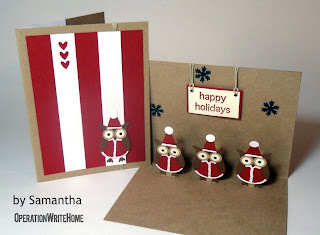 What a fun tutorial and I just love the owl card!